"LLOV" redirects here. For the virus, see Lloviu virus. 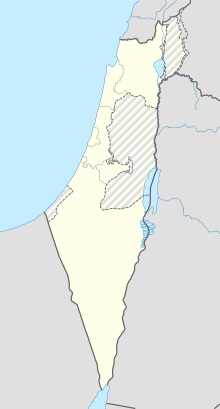 Ovda Airport (Hebrew: נְמַל הַתְּעוּפָה עֻבְדָּה, Nemal HaTe'ufa Uvda; (IATA: VDA, ICAO: LLOV) is a military air base and former joint-use civilian airport in the Uvda region of southern Israel, about 60 km (37 mi) north of the city of Eilat. It was the country's second international airport. Ovda was originally built as a military airbase in 1980 following Israel's withdrawal from the Sinai Peninsula as part of the Israel-Egypt Peace Treaty because the Israeli Air Force needed alternative airfields to its Sinai bases. The airport ceased handling civilian flights on 31 March 2019 thanks to the opening of Ramon Airport, which is located much closer to Eilat than Ovda. Ovda Airport started out as an airbase for the Israeli Air Force, constructed by the United States as a replacement for Etzion Air Force Base. It opened in 1981. The Israeli Airports Authority began operations from Ovda Air Force Base in 1982, after the signing of the peace treaty with Egypt. Previously all charter flights from Europe had landed at Etzion, however this was one of three airports in the Sinai that were handed over to Egypt as part of the Camp David Accords. A civilian terminal was built at the airport which handled direct charter flights from Europe. In 1988 a decision was made that international flights bringing tourists to Eilat would land at Ovda, instead of at Eilat. This allowed the operation of large, wide-body aircraft, such as the Boeing 747, which cannot operate from Eilat Airport. Between the late 1980s and 2019 most international flights landed at Ovda instead of Eilat. The runway at Ovda also allowed long range flights to take off for any European destination without the need to refuel. In 2005, the airport had 746 international aircraft movements and 82,479 international passenger movements. On 23 July 2014 after the temporary stoppage of international air traffic to Tel Aviv Ben Gurion Airport, due to rocket fire on Israeli cities from Gaza, Ovda Airport was opened to accept all international traffic. The airport ceased all civilian flights on March 31, 2019, now that Ramon Airport in the Timna Valley has opened. All civilian traffic was transferred to Ramon Airport on 1 April 2019. ^ a b "Facts and Figures". Archived 4 March 2016 at the Wayback Machine Israel Airports Authority. Retrieved 22 February 2016. ^ a b c d e f "History of Eilat Airport". Israel Airports Authority. Retrieved 31 August 2007. ^ "Facts and Figures". Israel Airports Authority. Retrieved 31 August 2007. ^ Sky News Team (22 July 2014). "Airlines Halt Israel Flights Amid Rocket Fire". Retrieved 23 July 2014. ^ Staff (23 July 2014). "Israel set to open second int'l airport near Eilat in response to flight cancellations". Retrieved 23 July 2014. ^ "New $470m Ramon Airport handles first domestic flights". trbusiness.com. Retrieved 6 February 2019. ^ "Eilat's new International Airport On Its Way". IAA. Retrieved 1 May 2007. Airport information for LLOV at World Aero Data. Data current as of October 2006.